The science program is a challenging, structured, well-rounded curriculum which provides a basic understanding of the areas of ecology, earth, life, physical, and health science. The hands-on nature of the program ensures a child-centered approach that stresses following directions, making predictions, assessing results, and drawing conclusions. There are two main focuses of the program: learning to find answers to problems using available resources and testing theories through hands-on activities and laboratory investigation. Science in Kindergarten through fourth grade is taught by each homeroom teacher. A science specialist instructs grades five through eight in the Upper School lab. 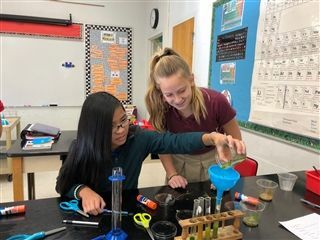 In the Lower and Upper School labs, the students have a wide variety of tools and equipment available, which often incorporates skills from the areas of reading, writing and math. Students move at a challenging pace and are encouraged to develop their own interests in the areas of science and technology.